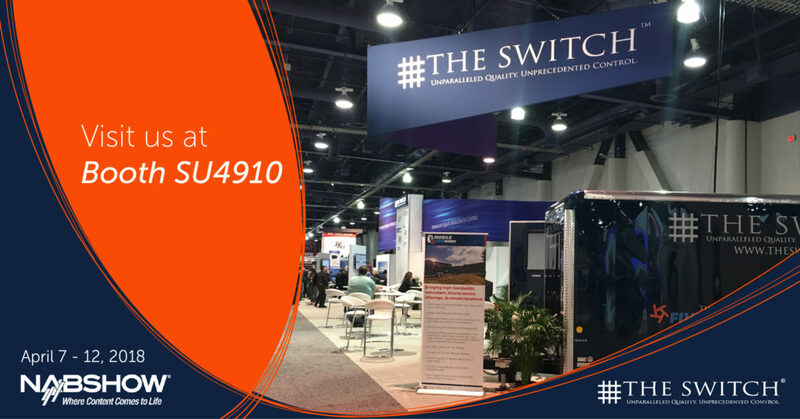 NEW YORK, MARCH 20, 2018 – The Switch will be showcasing its complete line of production and transmission services, including its value-added applications that leverage the power of The Switch’s worldwide transmission services platform, at NAB 2018 (Booth SU4910). The Switch’s rich suite of products will be on display utilizing its patented, customer-controlled switching platform, SwitchIT. The Switch At-Home, The Switch OTT, The Switch Studios as well as The Switch network extensions The Switch Mobile and The Switch Ethernet will be featured at this year’s show. Leveraging its global fiber and satellite transmission network, in recent years The Switch has focused on increasing its network’s reach to content producers, distributors and rights holders, in more places than ever before. By extending its network via The Switch Mobile, which includes a fleet of remote production trailers, and The Switch Ethernet, which currently connects more than 175 venues to The Switch’s network, The Switch is not only able to increase the rich community of users connected, but is also able to truly support the entire media eco-system. The Switch At-Home: HomeRuns, The Switch At-Home service, runs on The Switch’s high-reliability network and seamlessly integrates camera feeds, audio channels and file-based workflows to enable production at customer broadcast centers. The Switch’s At-Home virtual service goes one step further in cost-efficiency and flexibility, utilizing The Switch as production control, producing programming in The Switch’s secure private cloud, housed in The Switch’s hardened facilities, for delivery to clients linear and non-linear platforms. The Switch OTT: Leveraging the extensive customer and venue connectivity of The Switch network, The Switch OTT acquires, encodes and formats media for access to Content Delivery Networks and/or by “Amazon Web Services (AWS),” Direct Connect. By providing a full range of live event packaging and management services, The Switch OTT can integrate content elements into live programming customizing the OTT experience for every platform. The Switch Studios: The Switch operates nine studios in the heart of major media markets: Burbank, Los Angeles, New York and London. Connected to The Switch fiber network and satellite facilities, The Switch Studios are ideal for media tours, including multi-talent interviews, product staging, VO, demos and inserts, with a complete complement of cameras, audio equipment, lighting, teleprompter and wide selection of city backgrounds. Additionally, The Switch’s Burbank stages offer greater space and technical resources, multiple green screen facilities and the ability to host a studio audience. SwitchIT: The Switch’s unique, patented, switching platform, SwitchIT, puts the customer in control of scheduling and provisioning The Switch network, whether scheduled or on-demand, with no minimum or maximum times and no cancellation penalties. The Switch Mobile: The Switch operates a fleet of production trailers that brings high-bandwidth, redundant, diverse services to remote locations. Each 22-foot trailer handles a minimum of eight inbound/outbound videos or ASI paths and up to 16 Ethernet connections, extending the high quality-of-service of The Switch network to remote television productions. The Switch Ethernet: Built into more than 175 venues, The Switch supports remote production with Ethernet circuits provisioned over the same high-quality network that provides its primary transport between venues and points of presence. The Switch is a leading global video solutions service provider, with owned and operated facilities in North America, Europe and the Asia Pacific region. The Switch currently provides advanced video switching and local fiber circuit services, scalable Ethernet, at-home remote production, production studios, OTT transcoding, satellite delivery and network origination to more than 800 demanding video content producers and distributors around the world.